Ashe County Cheese was started in 1930 by the Kraft Corporation. Kraft helped consolidate several small community cheese plants in the area and provided the means and expertise to produce cheddar daisy wheels for distribution nationwide. They operated the plant until 1975 when they sold it to then manager, Chesley Hazlewood. Mr. Hazlewood operated the business until his death in 1980. In 1981, Mrs. Hazlewood sold Ashe County Cheese to Jerry Glick and Doug Rudersdorf, two cheese men from Wisconsin. Glick and Rudersdorf remodeled and upgraded both the cheese plant and the cheese store, located across the street. They also added a viewing room to the plant. It was at this point that Ashe County Cheese became one of the most popular tourist attractions in North Carolina. In 1986, Ashe County Cheese was sold again, this time to the investment firm of Finevest Services Inc. of Greenwich, Connecticut. Then in 1991 Finevest Services was reorganized and Ashe County Cheese became a part of Interlaken Capital, also an investment firm out of Greenwich, Connecticut. Finally, in 1994 Interlaken Capital sold the assets of Ashe County Cheese to Newburg Corners Cheese Inc., a Wisconsin Corporation owned by Mike Everhart and Tom Torkelson, the current owners. Everhart moved here with his family in 1995 to manage the company, while Torkelson remained in Wisconsin and has since become one of the nations finest cheese makers. He has won many National and International awards for his cheeses, and in the fall of 2007 was awarded the distinction of Wisconsin Master Cheesemaker. In 2004, Ashe County Cheese was split into two separate companies: Ashe County Cheese Company (the plant division) still owned and operated by Everhart and Torkelson, and Ashe County Cheese Store, now owned and operated by the Everhart Family. Though two separate companies, the businesses work hand in hand to efficiently utilize both work space and personnel. 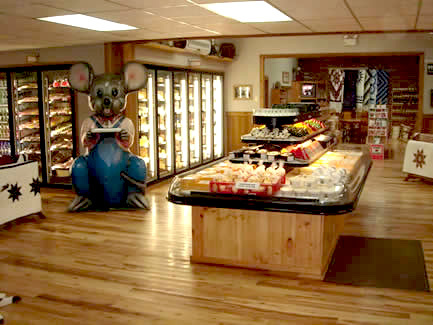 Ashe County Cheese Store has remodeled and expanded several times through the years, with the most recent remodel and addition being completed in the spring of 2007. The store now offers not only all the products made here, but also a wide variety of other food and gift items. 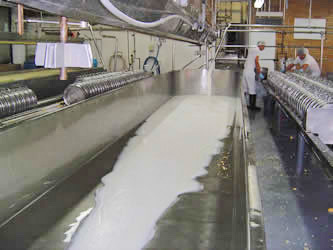 The plant has also undergone several upgrades since 1994, and though it still makes old style cheddar daisy wheels, it now produces a wide variety of cheeses and butter. It has developed a strong following for its original Sienna cheese, its many flavored cheeses, and its newest variety Juusto cheese (a mild Scandinavian cheese). With a rich history covering more than 75 years, Ashe County Cheese is well positioned to face the many challenges of the future, and we look forward to serving your needs for many years to come.